Inspired by Dustin Cable's racial map, Harvard PhD student Robert Manduca plotted another incredibly detailed map of every job in the US. Or at least every job in 2010 (the most recent census data year). 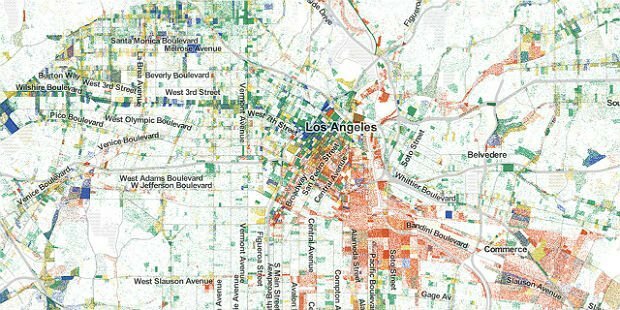 Manduca's map breaks down professions by color: factory and trade jobs are red, professional jobs are blue, health care, education, and government jobs are green, and service jobs are yellow. Approximately half of Los Angeles's jobs are in the factory and trade industry, via RobertManduca.com. Manduca credits Cable with sharing his code online transforming what might be a work-intensive project of a "dataset and an idea to a finished visualization" quite easily. While the island of Manhattan is awash in a sea of blue and green, via RobertManduca.com. There are very few factory jobs in San Francisco which makes sense given the city's reputation as a tech giant, via RobertManduca.com. The beauty of Manduca's map is its ability to easily chart and visualize large sets of data. One can simply look at the map and not only see that jobs are clustered in major metropolitan cities but also see how job sprawl affects nearby suburbs.